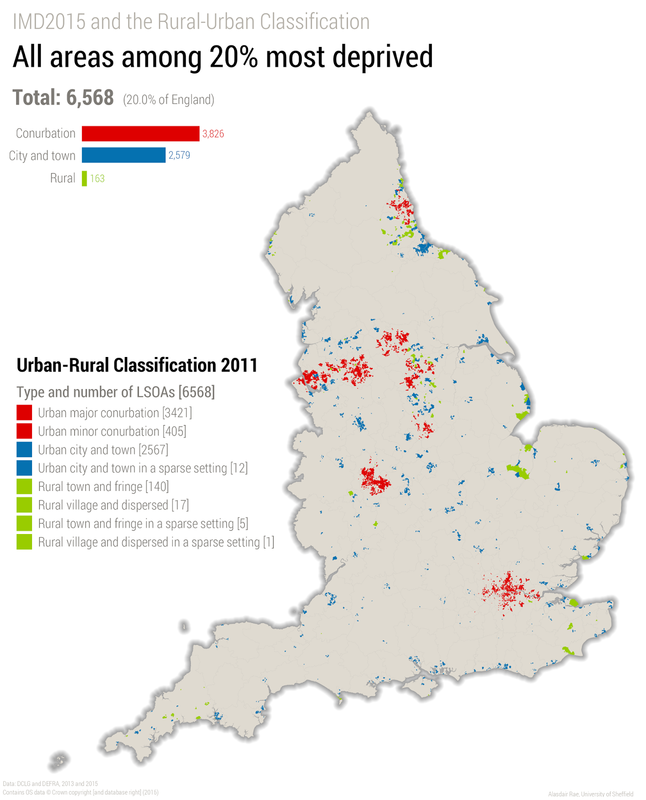 Stats, Maps n Pix: How Urban is Deprivation in England? The answer to the question above is 'very'. However, it's not all about the big cities, and there are significant pockets of deprivation in rural areas that don't often get the attention they deserve. 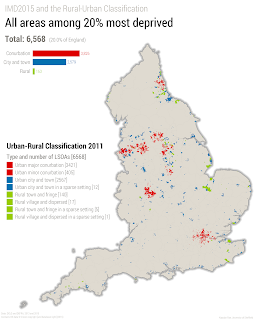 In this post I take a little look at the distribution of England's most deprived areas (the 20%) in relation to the 2011 Rural-Urban Classification - developed for the government by Paul Brindley and Peter Bibby here at Sheffield. 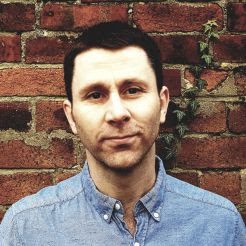 The ideas is to try to shed more light on the kinds of places that we find among England's 'most deprived'. Let's take a look at this in overview first of all. 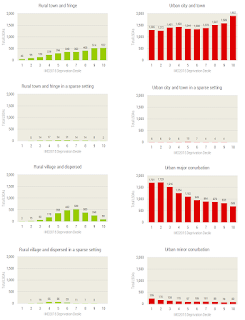 Sometimes it's a bit difficult to tell from a map like this how it all breaks down by category, so I also did two sets of charts - one each for the % and total in each deprivation decile in England (where decile 1 is most deprived, 10 least deprived). 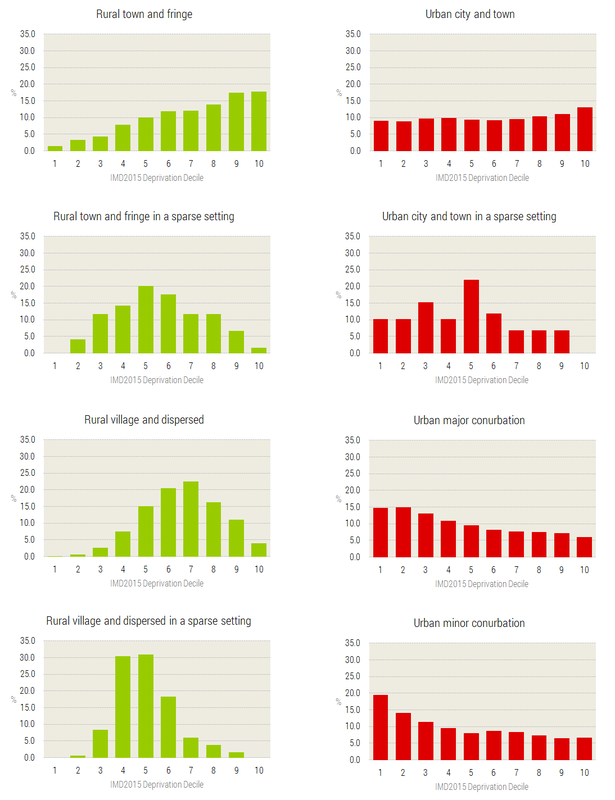 In the % charts below (click to enlarge) you can see the nature of the distribution by rural-urban classification type, followed by the total number in each decile in the second set of charts. Given the nature of what is being measured, and the distribution of the population by socio-economic status, this is not particularly surprising. What I do find interesting is the extent of deprivation among non-'conurbation' areas (one of the types in the rural-urban classification). You can see these in the map below, coloured blue, followed by a zoomed-in map for Blackpool. 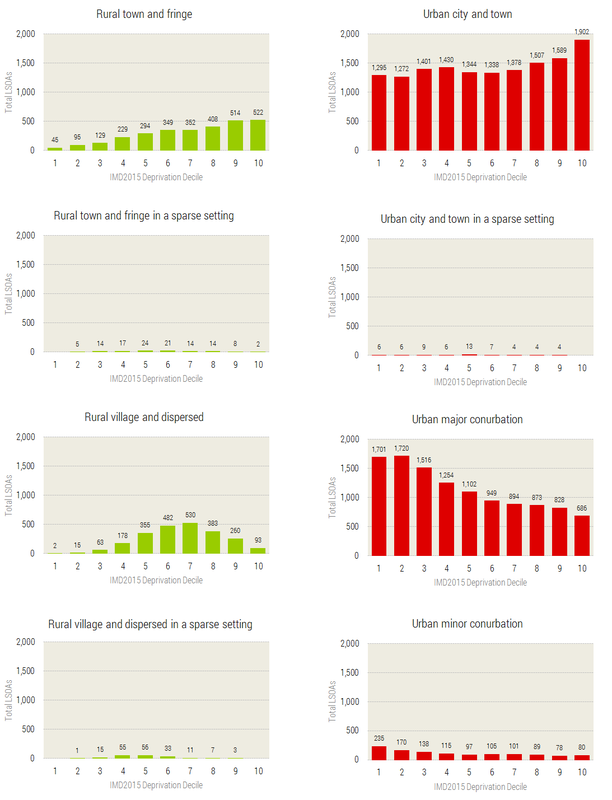 In some areas there is more of a mix of area types on the rural-urban classification, with rural, town and conurbation areas all featuring. Two examples here are County Durham and Barnsley, as you can see in the maps below (green for rural, blue for town, red for conurbation). This reflects the industrial heritage of these places but it also raises the issue that the policy solutions (or responses) may need to be tailored to meet the needs of very different local contexts. Well, that's for another day but at least this typology helps us identify the different character of areas that are often lumped together. One area of the country that often seems to be overlooked - at least from a national perspective - is Cornwall. It's a very large local authority and the patterns of deprivation here are much more dispersed and not in conurbations. So, I've extracted a couple of maps here too - one with place names and one without. 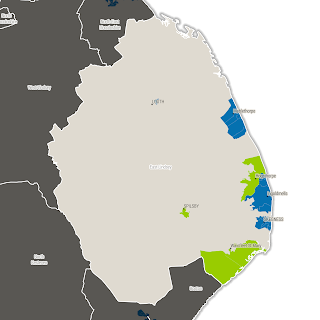 To highlight one further kind of deprivation in England I have also produced a map of East Lindsey, which helps identify some areas of deprivation on the east coast. 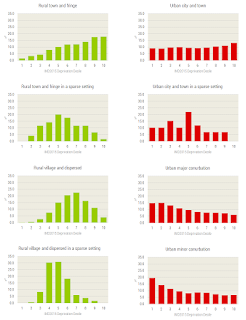 As you can see, they are a mix of rural (green) and town in the rural-urban classification. So, the answer to the question is of course that deprivation in England is 'very urban' but also that we find pockets of deprivation all across the country and often not in the kinds of inner-city locations we hear most about in the news, in government reports and in my maps. So, I'm trying to draw a bit more attention to it with this post. 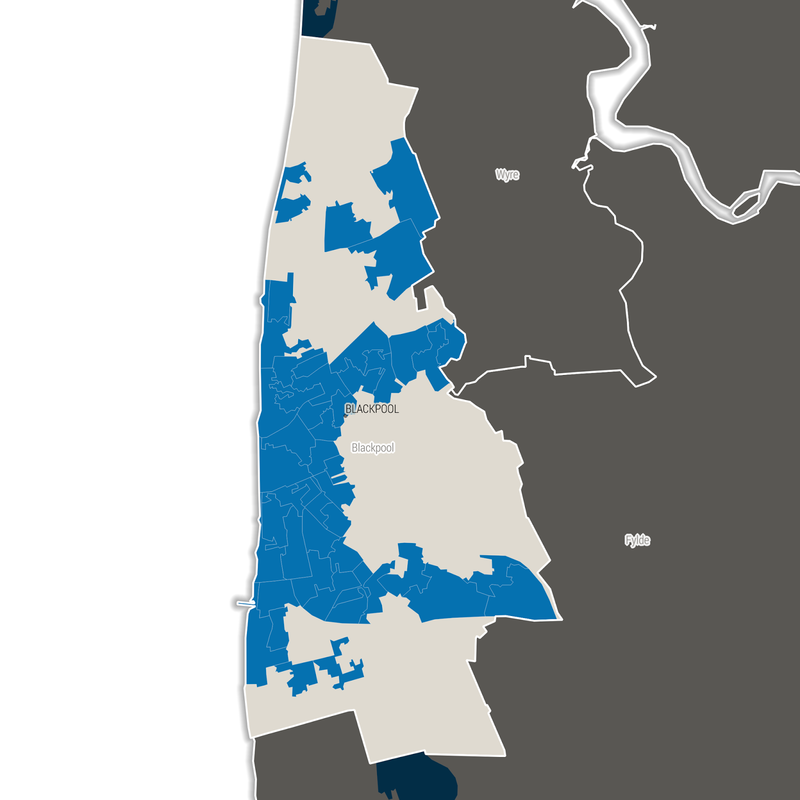 Finally, here's all the areas together in a single animated gif, just to highlight the variable geography of the most deprived 20% by area type. If you're looking for a map of deprivation in your area, see my IMD 2015 resources page.